Hello there! 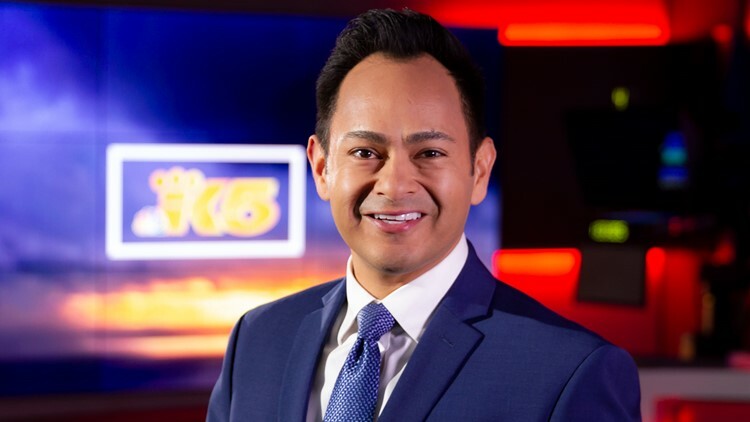 I joined the KING 5 Weather team in September 2018. Life is short and we're not guaranteed tomorrow so make the most of today — words I try to live by. I try to spread positive energy every single day. How? Well, I began each day with a great cup of coffee, and a nice long walk or jog with our two dogs. I believe life is about surrounding yourself with fun people and love. As for my career, I've been forecasting the weather up and down the West Coast for about 20 years, and I'm excited and proud to call Seattle home. My on-air career began in Fresno, California, at KFSN-TV, with stops at KNTV in San Francisco, KGTV in San Diego, and most recently at KCBS/KCAL in Los Angeles. My love for the weather began at a young age. I grew up in Pojoaque, New Mexico. That's a small town about 8 miles north of Santa Fe. Pojoaque sits about 6,000 feet above sea level, and we had all 4 seasons. When I was a kid, I wanted to know what made the clouds "bubble" up, why rain fell from them and why they created lightning flashes at times. Weather just made me curious, so I decided I wanted to be a weatherperson when I grew up. I'm still a kid at heart, and I've been lucky enough to earn a living doing what I love. I'm honored and proud to house five Emmy Awards on a shelf at home. They are for Best Weathercaster in the Pacific Southwest 2013 and 2014, Best News Team in a Large Market 2007, 2013 and 2014. In 2015 I as voted "San Diego's Favorite Weathercaster" by viewers in a social media contest. It's humbling to know viewers invite us into their homes and trust our weather forecasts. I married my best friend in San Diego in 2016, and we are thrilled to plant our roots in the Northwest! We love our fur babies, which are all rescue animals, so you will see us out and about with Cooper (Rhodesian Ridgeback/Labrador mix) and Riley (Pit bull mix). We also have one cat named Mister Clyde. You'll also find me out on my road bicycle or hiking the trails. I love meeting people, so if you see me out and about, please say hello. I hope you'll follow and connect with me on Twitter and Facebook. You can also email me at cherrera@king5.com.